Oven Roasted Asparagus is one of my favorite side dishes. It goes with just about any dinner. I love the earthy flavor of fresh asparagus. When you roast it in the oven it enhances that flavor in the best way possible. Sprinkle a little parmesan cheese or lemon over the top and you have a stand-out side dish that might out shine your main entree! 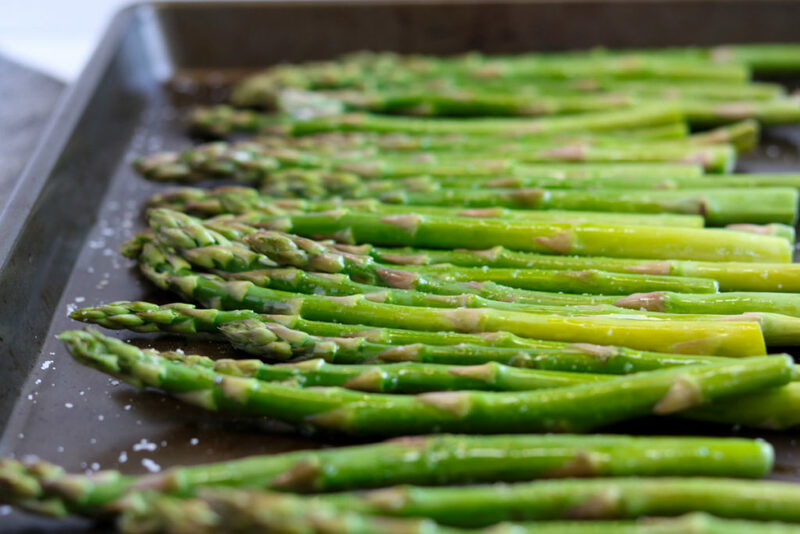 Oven roasting is the perfect method for cooking fresh asparagus. It is so easy, only requiring 3 ingredients, a sheet pan, and 10 minutes. It also leaves the spears crisp-tender, which is the perfect texture, exactly how it should be. Asparagus grows wild in the midwest, where I grew up. In the spring my entire family would gather at my grandparents house and we would have an asparagus hunting day. Everyone would put on their grubby clothes, tie their hair up in bandanas and pack a pocket knife to cut down the wild spears. We would spend the afternoon trekking thru the ditches of Iowa looking for asparagus to harvest. At the end of the day we would be loaded with more asparagus than one family could possibly eat in a week! After coming home we would do a quick tick check and then move on to preparing our feast from the afternoon spoils. My grandpa would grill farm fresh T-Bone steaks and my grandma would prepare all the asparagus you could ever want to eat. After the weekend everyone would be sent home with their own bundle of wild asparagus. I still think about those days every time I eat asparagus… or a T-Bone steak! You always want to make sure you trim the woody hard stem end from your fresh asparagus. You will never be able to chew thru it and you don’t want your guests politely chewing for 10 minutes! I learned the best way to accomplish this by watching an episode of Rachel Ray, years ago! Grab one spear by the larger stem end with one hand, and a little below the frans end with the other hand. Gently bend the asparagus until it snaps. Right where it snaps is the point between the tender portion we eat and the woody portion you toss. Now line that piece up with the rest of the bundle (at the frans end). Then cut the rest of the asparagus at the point where the pre trimmed piece ends. Voila- you’re left with tender, yummy asparagus, ready to cook! This recipe is also a staple on our Easter table. It just screams SPRING and adds beautiful color to the menu! I would love to hear from you! Did you make my recipe? Let me know in the comments or drop me a line. If you love to share your food pics with your friends, don’t forget to tag me so I can see too♥ @momsdinnerinsta on Instagram or @momsdinner on Facebook. Or just use the hashtag #momsdinner and I’ll find ya! I hope you give this recipe for Oven Roasted Asparagus a try in your kitchen. Oven Roasted Asparagus is perfectly cooked fresh asparagus. By roasting the asparagus in the oven you end up with crisp tender spears. Exactly what you want! 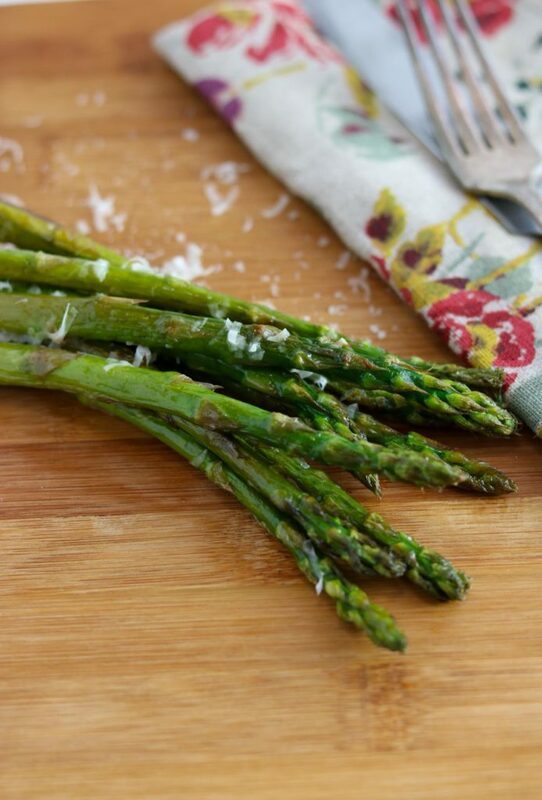 Add a little parmesan cheese or lemon zest to dress up your Oven Roasted Asparagus. Trim the hard ends from the asparagus and discard. 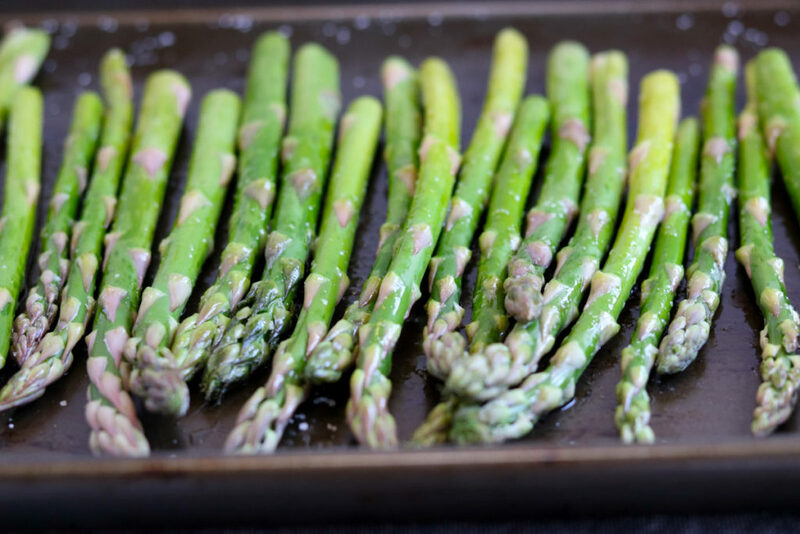 Place the asparagus on a large sheet pan and drizzle with olive oil. Using clean hands, toss the asparagus to coat with the oil. Bake for 10 minutes, shaking the pan half way thru to rotate the asparagus. Optional-- sprinkle with lemon zest or parmesan cheese. Reminds me of Easter dinner but great anytime! 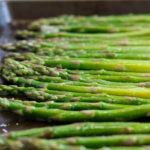 We love asparagus…thanks for including so much information! We love it too- one of my favorite veggies! 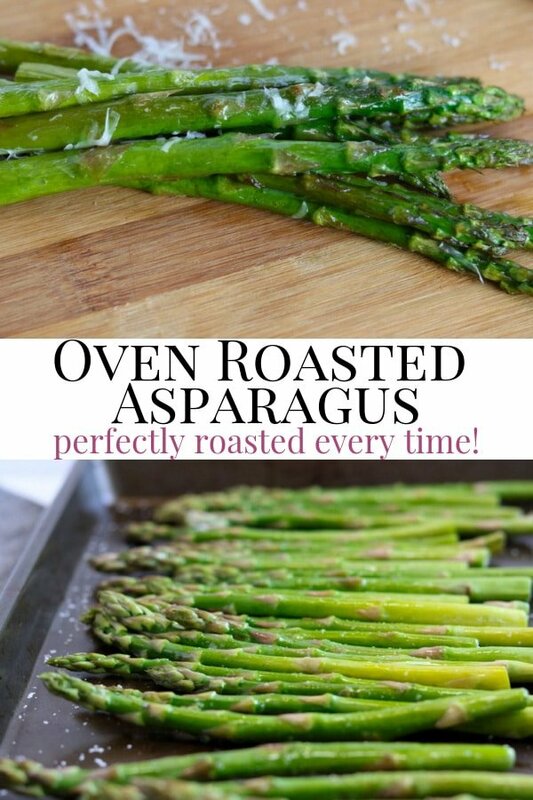 This is my favorite way to make asparagus! So delicious!! It is perfectly cooked every time! It grows wild in Iowa (just in the ditches, nothing fancy!). I’m not sure about Ohio, but I imagine you have a similar climate as Iowa. Luckily you can snag a bundle for $1.00 at the grocery store or farmers market when it’s in season! This is exactly how I prepare my asparagus and it never fails me. I love the idea of adding a little lemon zest. Perfect for any dinner and yes, locally grown is always best. It truly is a never fail method! Those are the best recipes. Definitely try a little lemon! Yummy! Asparagus is one of my favorite vegetables! I usually just steam it and call it a day, but I love the idea of roasting it! I can’t wait to try it! My favorite veggie too, and I love it when I can get a bundle for $1.00 at the store or farmers market! Definitely try roasting it in the oven. You’ll never go back. This recipe is amazing. 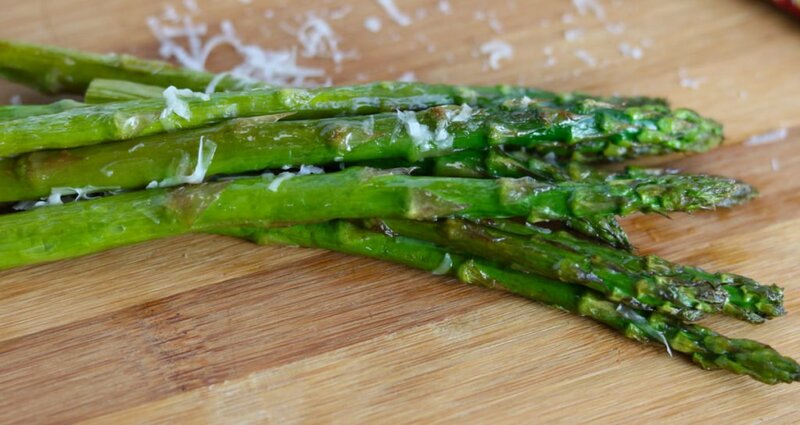 Love the Parmesan on the asparagus. We grew it on our family farm in Connecticut. Pinned for later! Thank you for pinning! FRESH asparagus cannot be beat. I love food memories like that!